Directives from major research funding agencies in the past decade or so established Data Sharing requirements for grant applications: specifically, applications must include a supplementary document, usually called a “Data Management Plan” that describes how the proposal will conform to policy on the dissemination and sharing of research results. The National Institutes of Health (NIH) Data Sharing Policy, targeted primarily at the biomedical sciences, was effective with applications made after October 2, 2003. The National Science Foundation (NSF) public access mandate has specific requirements for social, behavioral and economic sciences and was effective for proposals submitted or due on or after January 18, 2011. Click here for NSF data management guidelines. Also, in February 2013, the White House Office of Science and Technology Policy (OSTP) issued a memorandum directing federal agencies that provide significant research funding to develop a plan to expand public access to research. Among other requirements, the plans must "ensure that all extramural researchers receiving Federal grants and contracts for scientific research and intramural researchers develop data management plans, as appropriate, describing how they will provide for long-term preservation of, and access to, scientific data in digital formats resulting from federally funded research, or explaining why long-term preservation and access cannot be justified." DataCite: Focused on developing and supporting "methods to locate, identify and cite data and other research objects. Specifically, DataCite develops and supports the standards behind persistent identifiers for data, and our members assign them. IASSIST: IASSIST members "advocate for responsible data management and use, to build a broader community surrounding research data, and encourage the development of data professionals." re3data.org: A Registry of Research Data Repositories sponsored by DataCite. Research Data Alliance: RDA enables data to be shared across barriers through focused Working Groups and Interest Groups, formed of experts from all around the world – from academia, industry, and government. Data management plan: a formal document that outlines what a researcher/research team will do with the data collecting during and after a research project. Data curation: The University of Illinois’ Graduate School of Library and Information Science defines data curation as “the active and ongoing management of data through its life cycle of interest and usefulness to scholarship, science, and education. Data curation activities enable data discovery and retrieval, maintain its quality, add value, and provide for reuse over time, and this new field includes authentication, archiving, management, preservation, retrieval, and representation.” Factors to be considered include file formats, data documentation (ie, metadata collection), and accessibility. Data archives/repositories: typically formalized, institutional repositories for data. Archives provide for long-term, stable, reliable access to data. 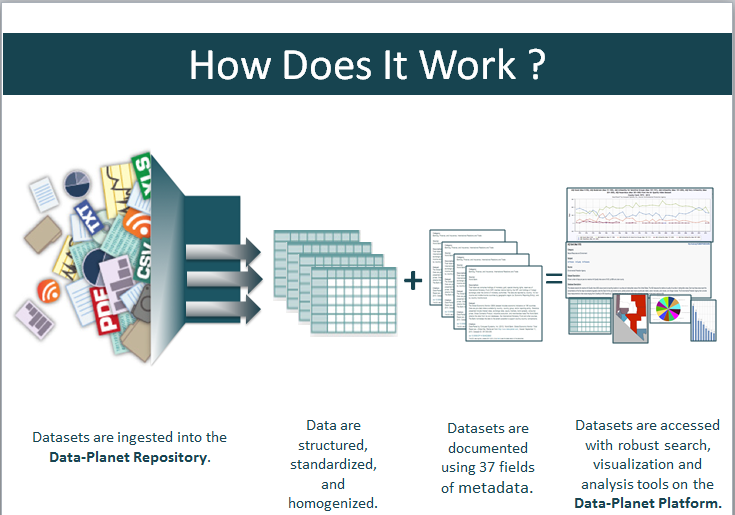 How Can Data Planet Help with Management of Research Data and Licensed Datasets? Data Planet facilitates storage, accessibility, usability, maintenance and archiving of statistical data, sourced from both third parties and direct from researchers, via our Data Hosting Services. Our Data Hosting Services seamlessly and securely integrate your data in the Data Planet platform, allowing users to compare and correlate your data against the entire Data Planet repository of statistical datasets in a single, easy-to-use interface. Our Data Hosting Services support researcher data management plans required by funding agencies. → For data licensed from a third-party data publisher, we will work with the publisher to 1) properly load the data into the Data Planet repository, 2) update and maintain the data, and 3) report usage of the data. We will help the licensee meeting license requirements and control access to the data. → For researcher-provided data, the Data Planet team will work with your staff to load the data into the Data Planet platform, create descriptive metadata, and control access. • Surface data of interest using the search and browse tools of the Data Planet platform. • Datasets are physically stored in a 24-hour secure facility behind three levels of biometric security. • Data are regularly backed up to an off-site facility. • Physical data can be encrypted and decrypted on access. • Access can be controlled at the dataset level – expose your data to all Data Planet users or only to those at your institution. We can also make it openly available via an API. • Including your data in Data Planet does not restrict it from being deposited in any other archive or repository. • Users can customize visualizations of the data in maps, charts, and graphs – with 20 format options. • Create *DOIs or other durable URLs of visualizations with descriptive metadata, ensuring the retrievability of the data. • Export the data in xls, csv, SAS, and more. Data security refers to measures taken to prevent unauthorized access to computers, databases and websites. Data security also protects data from corruption. Ensuring data security requires attention to three key areas, and here at Data Planet, we make sure do just that. Physical security: Data Planet uses CoreSite, an industry leader, to house our servers. CoreSite provides redundant, uninterruptible power supplies, as well as redundant on-site security measures at all facilities, and delivers high performance connectivity that beats industry averages. Data confidentiality and privacy: Data Planet uses SQL Server, which has Transparent Data Encryption, or TDE. TDE performs real-time I/O encryption and decryption of the data and log files. TDE protects data "at rest,” which covers both the data and log files. It provides the ability to comply with the many laws, regulations, and guidelines established in various industries. Disaster recovery: CoreSite facilities, where the Data Planet servers are housed, are built to withstand natural disasters. Further, Data Planet regularly backs up servers to tapes that are stored off site.